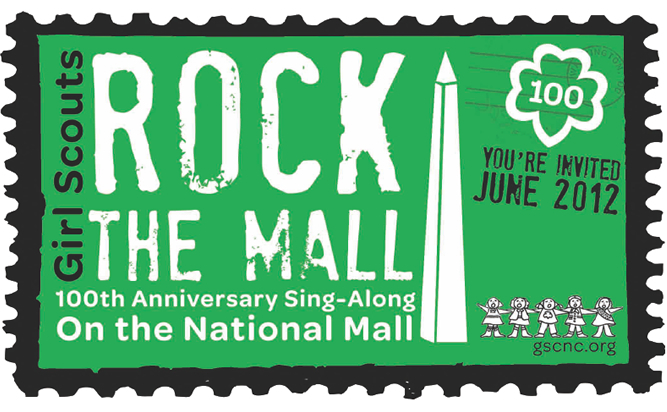 Celebrate the 100th Anniversary of Girl Scouts at the Sing-Along on theNational Mall. This is what memories are made of – good Girl Scout fun! 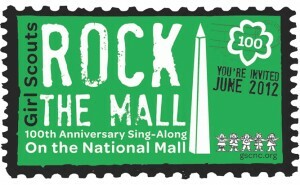 So bring your troop, your daughters and friends or come alone and join your Girl Scout sisters from across the country on the National Mall in our nation’s capital-Washington, DC– June 2012 to sing some of your favorite Girl Scout Songs. Please send me info about the 100th celebration. My troop is interested. Thanks! Since this event is next summer, the only information we have received is a “Save the Date” announcement that this is happening. I don’t always have a good pulse on the Girl Scout community, but following your council through newsletters or on twitter is a great start. I know that Girl Scouts of Western Washington and Girl Scouts Citrus Council both have accounts with Twitter. Please let me know the date so I can inform our Girl Scout troop and attempt to make plans to attend this event. Unfortunately I don’t have any further information. You can check out Nations Capital Girl Scout Council (linked in the article) to see if they have added info there. It’s not until next year, but best to plan early. It is on June 9th in Washington DC for the sing-a-long. For Florida, school gets out on June 6th. My mom and I will be on a flight on June 7th to Washington DC. They are also having a BIG 100th anniversary march, on March 12th 2012 in Savannah, Georgia. The will be closing the bridge, and have the girls walk over it, into Savannah for Girl Scout Founder Julliete Gordon Low. As a developer this means more potential customers, and more potential sales to those customers. Does it mean less jailbroken phones? Not sure.